The French Dip at Big Daddy's Burgers And Shakes. Big Daddy’s Burgers and Shakes is continuing its expansion push, opening a branch recently on the Upper West Side. I’m always delighted when a place shows up touting its burger, so I gladly tried it out. It was sore disappointing. The burger is unremarkable in just about every way. That isn’t to say it was bad, it just wasn’t particularly good, and certainly not good enough to build a franchise out of, in my opinion. Then again, people must be loving it, because Big Daddy continues his march across NYC. The menu features all sort of comfort foods I ordinarily love, so despite the burger letting me down, I figured I’d give the place another chance and explore it. This time at sat in the restaurant, as opposed to getting the food to go. The decor is headache inducing – bright colors that make you feel like you’re sitting inside a cartoon. I love cartoons and the magical reality they contain. Was there anything better than watching Bugs Bunny reach off camera and pull out whatever it was he needed or wanted at any given moment? If only I could’ve done that at Big Daddy’s, I’d’ve pulled out some better food. 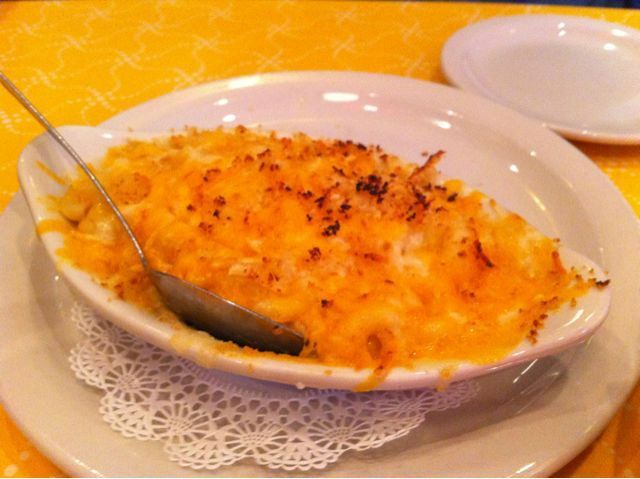 The mac 'n cheese at Big Daddy's. The same color as the table. Yikes. Beyond the garish decor, the service was disappointing. Our waiter was perfectly nice and friendly, but it took 20 minutes or so for our mac ‘n cheese to make it to the table. Sad to say the turnaround time wasn’t any better to get a replacement beer (which doesn’t need to be baked). The mac itself was also unremarkable. The top was satisfyingly crunchy, but Big Daddy makes the common error of mixing the cheeses involved, diluting what should be a rich, buttery flavor. Texture was good, but flavor was lacking. 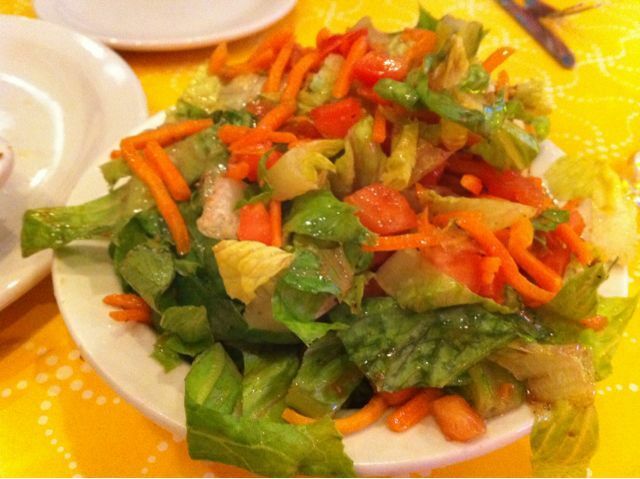 Take a look at that salad. Your eyes do not deceive you. I do not know how it is possible to make a salad greasy, but they found a way. 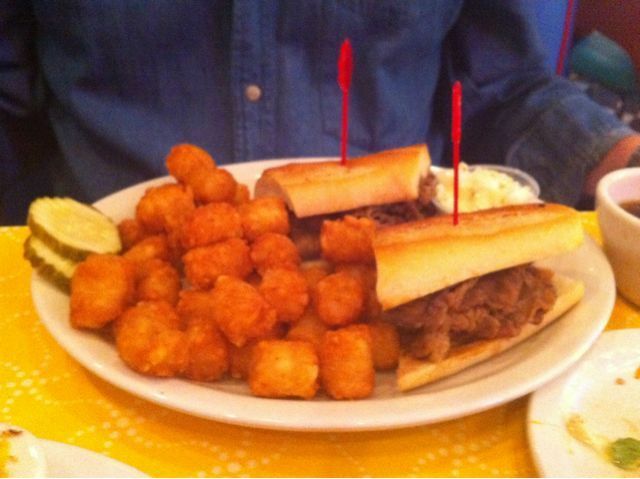 The French Dip at Big Daddy's. Honestly, you should be paying attention to the tots instead. 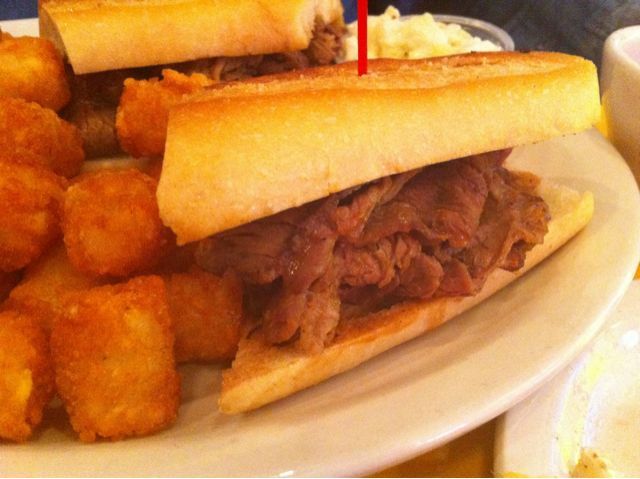 We decide to take on the French Dip in lieu of the burger. The good news is that it is indeed better than the burgers, the meat evokes a Philly cheesesteak, and there’s a good pepper flavor to the dip. 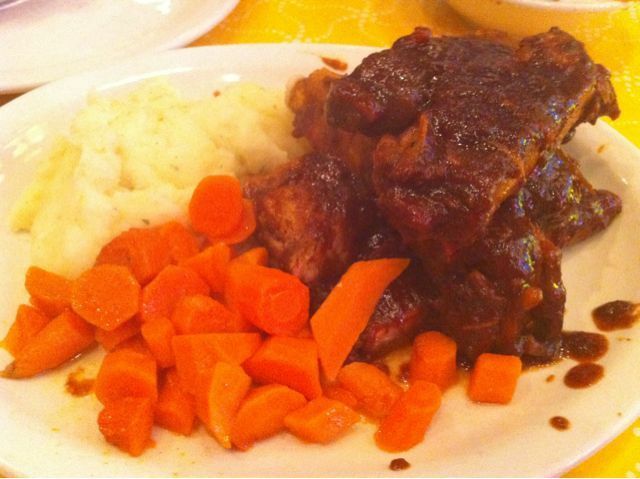 Are there ribs beneath all that sauce? The ribs were a sloppy, drenched mess. I love ribs, but prefer rub bbq, these are slathered in a much-too-sweet sauce and were basically a waste of time. The garlic mashed potatoes were tasty, though. All that said, let me praise what I think Big Daddy does exceptionally well: its tots. The tots are crunchy, salty and delicious. They are better than the tots you remember from the cafeterias of your youth, which were steam heated, drippy, and flaccid. Big Daddy’s tots are just delightful, why can’t the rest of the menu live up to this standard?